Vote for air and ground player of the week. we have a horse in both races this week! CJ sets an NFL record. And he's not up for it? I think it's only for QBs and RBs, hence the Air & Ground players of the week. I think it's dumb that WRs can't get the Air part of the award, but it appears that's just the way it's set up. Well it is the AIR (QBs) and Ground (RBs) player of the week. Guess FedEx needs another biz line so they can add another award. CJ didn't leap in to the air to catch any of those passes? I think he got double miles on all that air time. LOL. I won't even vote. If CJ is not eligible after what he did than it is an award that dosen't mean poop! No offense Matt and Reggie. I would agree if wr's were even eligible, but they arn't. Not voting for Matt as best qb of the week or Reggie for rb of the week because they don't vote on wr's is like boycotting mcdonalds because Taco Bell doesn't sell chiken wings. Go give Matt n Reggie some love man. Staff deserves to win IMO. Joe, have you tried those wings? I'd vote for Ellington over Reggie this week. I'm still mad that they continued to pass on him round after round. 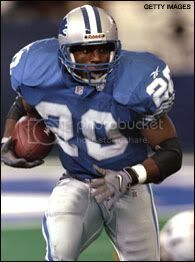 He was the perfect player to groom behind Reggie. He has holes in his game especially in pass protection but it would have been nice to have a big play threat backing up Reggie if he were to miss significant time. Well that would take away from UPS: What can Brown do for you, right? Talk about making deliveries, CJ delivered a record breaking performance. You heard it here first folks! Just give it a little time and Ellington will show why he got passed on. He was plagued by minor nagging injuries his entire college career. Unless the Cards have access to the Suns medical staff I doubt Ellington will hold up in the NFL. Stop the presses: A 329-yard game is enough to earn NFC offensive player of the week honors. Lions receiver Calvin Johnson, whose 329-yard performance in a win over the Cowboys was second in NFL history, has received the award for Week Eight. – Johnson caught 87.5% of the passes thrown to him on Sunday, for 20.6 yards per attempt. – Calvin Johnson has 440 receiving yards in the last six quarters. Charles Rogers had 440 receiving yards in his NFL career. 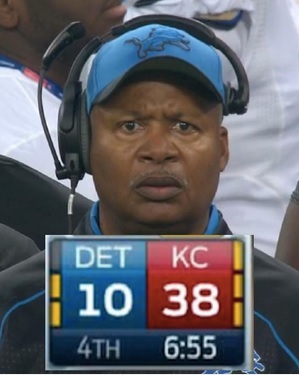 The Lions took both receivers with the No. 2 overall pick. – Megatron has 200+ yards six times in his last 27 games, counting the playoffs. No one else in NFL history has six career 200-yard games. Randy Moss had 200 yards once in 226 career games. Larry Fitzgerald has never had 200 yards in 154 career games. Marvin Harrison never had 200 yards in 206 career games. Cris Carter never had 200 yards in 233 career games. Tim Brown never had 200 yards in 295 career games. Johnson may be playing the receiver position right now better than anyone has ever played it. Wait....Cris Carter never had a 200 yard receiving game?? The way he talks, you'd think a 200 yard game for him was the normal day at the office.